Lathe leveling/parallelism using shop made levelers.. The Chinese 10x22 lathes like my Grizzly G0572/G0602 and many others I'm sure have a single mounting point in each foot. While one can add shims to get the ways co-planar that seemed like it would be a tedious process. Given that this procedure is not a one time deal, I wanted something more easily adjusted. I did a lot of research and received a TON of help from @mikey . Thanks to him as always for all his help! I made 2 leveling plates from 1/2" steel plate. The plates are 5" long so they are slightly wider than the feet and 2" wide. There are 5 holes necessary in each plate. 3 are thru holes and 2 are tapped holes for the leveling bolts. I used 1/2x20 grade 8 hardware for this project. I drilled and tapped the 4 leveling bolt holes and drilled the 6 thru holes on the mill. I also faced the bolt heads to remove the grade markings and provide a flat bearing surface. Jam nuts are used on the bolts. The feet on this lathe are not exactly conducive to doing this mod. There is an open area in the center with a round cast boss for the hold down bolt. I cut 1/4" steel plates for each foot, 5x6 for the tail stock end and 5x7 for the head stock end. Those plates are bolted to the feet with 1/4x28 bolts. On my application the chip pan is meant to be mounted on the factory stand which has reinforcing plates on the top of each end. This means the chip tray does not sit flat at the through hole. I cut 2 - 6" x 6" aluminum spacers. I used transfer punches to mark the holes so I could drill them in the chip pan, spacers and bench top. The leveling plates were then mounted to the bench. At this point it's time to set the lathe on the levers. Here you can see how the leveling bolts contact the plates on the feet. Once the lathe was placed on the bench I loosely installed the mounting bolts and began the leveling process. For me the only adjustment needed was to the rear leveling bolts so I locked down the front bolts and moved on with the process of adjusting. I began at the head stock. This is the first time I have ever done this and I was very much amazed at how little adjustment it took to make a huge difference. It is a must to use fine thread bolts for the levelers. I used 123 blocks on the ways and a Mahr 12" machinist's level for this process. It only took a few minutes to get the head stock end perfectly level. I did figure out that once I get very close if I very lightly snugged the mounting bolt it helped me to see the very slight movements as I adjusted the lever. Moved to the tail stock end. Only a couple of minutes to get it perfectly in plane with the head stock. I also like the added height that the levelers make between the bed and the chip tray. Much more room to clean out the chips. Thanks for looking and I hope this is helpful to someone. Big help, still figuring out how to make up a muti point leveling system, this helps!! Awesome! Glad to be of help. Whilst I see that you have put plates under the feet, which is good, I was a little shocked to see just how thin and weak the casting is, particularly at the tailstock end and to see a groove right across, running through the hole for the bolt. That is exactly where I would expect the casting to fracture at some point in time. That's not a groove. I made that mark with a Sharpie during the planning and measuring phase. Thanks for pointing that out to me. I've been back and looked at that picture again, it sure shows how deceptive a photograph can be ! However it still doesn't alter my feelings that the casting is potentially weak at that point. Cast iron doesn't take much bending stress before it breaks, particularly in thin sections. This is not a criticism merely a question. Why would you place a small lathe on a bench that does not have a foot/knee recess? Guess I don't understand the question. Lots of people use this style workbench for these lathes. I'm perfectly comfortable standing at the lathe. So am I, however I have never run a small lathe without a knee well only large machines where it is not possible and am always whacking my knees on the carriage controls, this becomes annoying after the first 8 hours. This machine has most of the apron controls a knee height. The bench top is 38". The lowest point on the carriage wheel is 43". Terry, that looks very clean and you will enjoy the extra space as well. I have my 1340 Jet mounted in a very similar way. I made a 2 3/8" high solid riser pad for the head stock end and a 1/2-20 bolt adjusted set of 3/4 plates for the tail. Fine thread bolts are a necessity. I should add that my cabinet is flat faced as well !! Very nicely done and documented, Terry - good job! While a knee space would have been ideal, you will not find such a thing at Home Depot. Most dedicated factory stands for smaller lathes have such a space but that is not the case here. One thing that you might do at some point is find that you need to move the lathe closer to the front of the bench top if your back starts to complain. Otherwise, I think you're going to be okay. Ordinarily, the casting for the locking bolt is a weak link. However, it is now sitting flat on top of a 1/4" thick steel plate for added support underneath. The stress is now transferred to the plate. Moreover, Terry used a spacer nearly as wide as the locking bolt ear up top so that ear is even more well supported. Yeah, it might crack but it is far less likely to happen with this arrangement; you do not need a ton of torque to lock the lathe down. Quite frankly, I think using shims would lead to more stress on the ear because the ear is floating in mid-air when using shims. You would think that trying to twist/un-twist an induction hardened short bed like this would be difficult but this leveling arrangement makes it quick and easy to do. 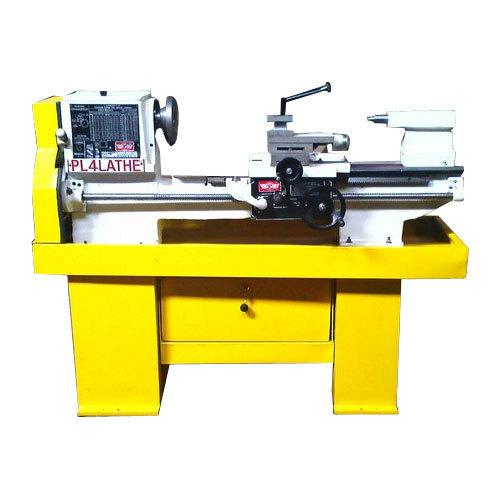 Given that all lathes move over time, having a fast and precise method of leveling the lathe is sort of a big deal. Terry, now you need to do a 2-collar test to fine tune the level and check the alignment of your head and tail stock. In about 2-3 weeks, re-check everything and then check periodically. Thanks Mike! Next order of business is some disassembly and checking/cleaning/adjusting gibs etc... I want to make sure all the mating surfaces are clean and that there is no gunk anywhere it shouldn't be. It needs a good general lube before I do much actual work on it. It was/is pretty dry. Once I get it back together I intend to do the 2 collar test and verify alignment. So that definitely makes short work of leveling, but have you used it to now adjust out bed twist? No doubt that will make that a snap too, I'm more interested in the dance between level and twist. Depending on the trueness of the machine, balancing the two could be a bit of a nightmare....at least that's what I'm seeing. What one is searching for in this process is for the ways to be coplanar. Level really has nothing to do with it other than making adjustments until the bubble is in the middle is the simplest way to measure that both sides of the bed are in the same plane. You are actually inducing twist or rather offsetting the existing twist to force the ways to be parallel with this process. The bed could theoretically be completely out of level but as long as the ways are parallel to each other the lathe should not cut a taper. Theoretically. I'll do the proper testing in the next few days and report back. I added 1/4" steel plates to the feet. The plates serve to spread out the forces the leveling bolts exert on the foot. The plates also serve to reinforce the foot and reduce stress at the mounting bolt casting. I drilled the feet and mounted the plates while the lathe was supported on the engine hoist. I placed a 4x4 on my main bench so it would be under the bed as a pivot point and lowered the lathe until the bench was sharing the load with the engine hoist. Then I let first one end and then the other hang over my bench to perform the drilling and bolting. Guns, the way Terry attached the plate is very solid but you can get away without drilling the foot of the lathe at all. You can make a plate and drill a hole to pass the locking bolt as he did here, then drill and tap the steel plate for four short socket head cap screws; the heads would bear against the inside edge of the casting to effectively locate the plate. This keeps the steel plate from moving around while still providing full support for the lathe foot and the locking bolt part of the casting. Once the lathe is leveled and locked down, that plate will not move. This mod is well worth doing. Terry's execution is quite elegant but everything he does is well done. At least now you know that there is a simple way to mount your lathe that will make leveling adjustments relatively painless. Having leveled a lathe with shims myself, multiple times on the same lathe in fact, I highly recommend you consider emulating Terry. This mounting method is found on all the Emco tool room lathes and it is, by far, the simplest and most effective arrangement I have seen. I am starting to think I could use a 2x6 wooden block and put leveling feet on the blocks, x2 blocks one for each end of the lathe? I would use steel plates but dont have the steel nor the tooling. Do you all think wooden leveling blocks with adjustable feet would be a good work around? Kinda the same as mounting on a wooden bench right? 2x6 material is likely problematic from the get-go. It's construction grade stuff so not terribly consistent in density and is not a very good cut of wood for stability. If you can only use a wood product right now, maybe consider something like 3/4" MDF which is a lot more resistant to compression. You'd want to seal it though (paint) as it does have a propensity to absorb. Metal really would be better though both for the stiffness as well as fastener attachment. Man! It seems like as soon as those blocks of wood saw some oil...ugh. Maybe even wet season vs dry could be problematic. I totally want this mod, but never see a time I will have free time to do it. It's on my list thjough! I looked at the picture showing the “groove” closely and it appears to be a sharpie mark not a groove. The Chinese don’t want the lathe to last longer than a few years, so they can sell us another one. They don’t support repair parts longer than around 10 yrs. You won’t be seeing these things in usable condition at much more than 20 yrs or so for the better ones. Not at all like my 73 yr old Logan! Ok Terry, I've been obsessing over this for days. I don't want to do it as I just put the lathe in a month ago. Leveling the table...not so bad. Mounting and leveling the lathe (which is not as related to table level as you would think).....not fun. Adjusting/calibrating the lathe and finding the tailstock size is .004 bigger...less fun and so on... Now that I see this is kinda a have to do with these table top mini lathes, it means starting all over. Ugh. There will be a plate that covers the mostly open leg of the lathe, but just like the block that the legs are mounted in, I will rely on the center hole to keep it in place. Is there a fault to this reasoning? The pressure of the center mounting hole will keep all the stuff together and inline? No? It might work. The center bolt is just a thru hole so it'll do nothing to keep any of the components from rotating. For the little amount of time and effort it took to do I wanted to make sure the leveling plates and foot plates were not going to move and the leveling platesw were square and would remain square to the mounting hole. I think you want to mount the bottom plate to the bench to keep it from climbing the adjusters as you turn them. Maybe one extra through hole to bolt plus a washer and bolt on the center hole that runs through lathe to keep it flat on the bench. I can't believe there is not a set of lathe leveling plates available readily when we buy the lathe. I am thinking a thick 1/2" steel rectangle with 4 leveling feet and a bigger footprint than the lathes current footprint. put a slot system so it could handle different bolt patterns and bolt your lathe to the plate then use the 4 plate feet to level each end. Is this already available somewhere? Not available commercially to my knowledge. I mean, we are machinists, right? I don't necessarily disagree with anything you said. However, all lathes need to be checked and aligned from time to time and this will make that process quick and painless. I also have no intentions of ever moving it. I may do away with the wheels and/or make some brackets for levelers on the bench. The workbench has many things in it's favor such as the available storage right at the machine and the fact that it weighs 455lbs. empty. Those things put it far ahead of the sheet metal cabinets that these are typically mounted on in my opinion. The top is over an inch thick and made from many laminated strips of fingerjointed hardwood that are sealed. That should help to stabilize it even though I agree that it is likely to move at least some. My lathe is on a steel cabinet and not bolted to the floor but sat on a large piece of hard rubber on top of the tiles. About the only time I check that it is turning true is if I need to do any work longer than a couple of inches. I can easily turn a pair of collars 6" apart where the difference is down to a tenth of a thou. Not that it stays that way for long. A heavy cut will change things.